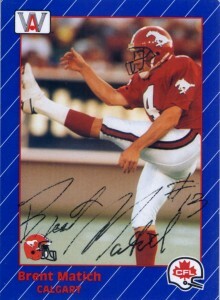 Originally drafted as a place kicker, Brent Matich was a left footed punter for the Calgary Stampeders from 1988-1991 and the Saskatchewan Roughriders from 1992-1996. He ranks 3rd in Roughrider history with 635 punts and 26223 yards. As with many players the data on Brent’s CFL career is sketchy at best.